Imagine a world some time in the semi-distant future where space travel is a banal indulgence not unlike a luxury cruise. What would you do upon stepping on Mars soil, an astronaut helmet over your head and Earth but a small speck in the distance. Be real, would you take a selfie? It would get soooooo many likes. 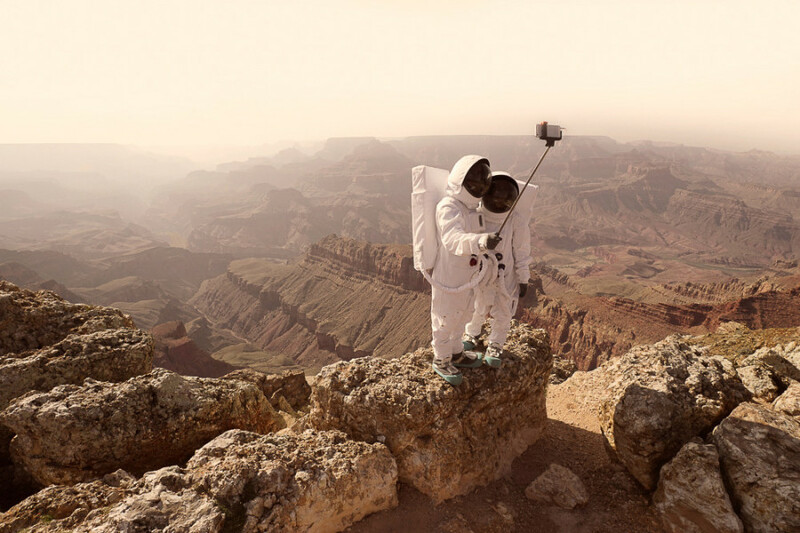 French photographer Julien Mauve juxtaposes the looming potential of space exploration with the stereotypical actions of earthly tourists in his narrative series "Greetings From Mars." The sci-fi photos combine alien landscapes with behavior that's all too familiar -- performing for the camera, inserting oneself into foreign landscapes, and striking a pose. "I've been fascinated with Mars since I was a child," Mauve explained to The Huffington Post. "I can picture myself back in college making presentations about it. We hear a lot about NASA, Elon Musk and SpaceX these days. Mars One also, the company that offers people a one way ticket to establish the first human colony on Mars (and intend to create a TV show out of it). Space exploration and colonization is the greatest adventure of the century and the fact that we may witness it in our life-time makes it even more exciting." Mauve couples the possibility of space tourism in the future with the reality of social media influence in the present. "We've literally developed a new language to communicate emotions through pictures and that really fascinates me," the artist said, identifying smartphones as the technology that allows us to write our own stories in real time. "In the mean time, Earth has become really small. We are only 12 hours and $800 away from the other side of the world. Those easy traveling conditions have made tourism a lucrative activity. People can visit and enjoy places we would have never imagined only 50 years ago... Once transportation issues will be solved and if we don't encounter any massive disaster, space tourism for middle class people is something we can imagine happening in less than 100 years." 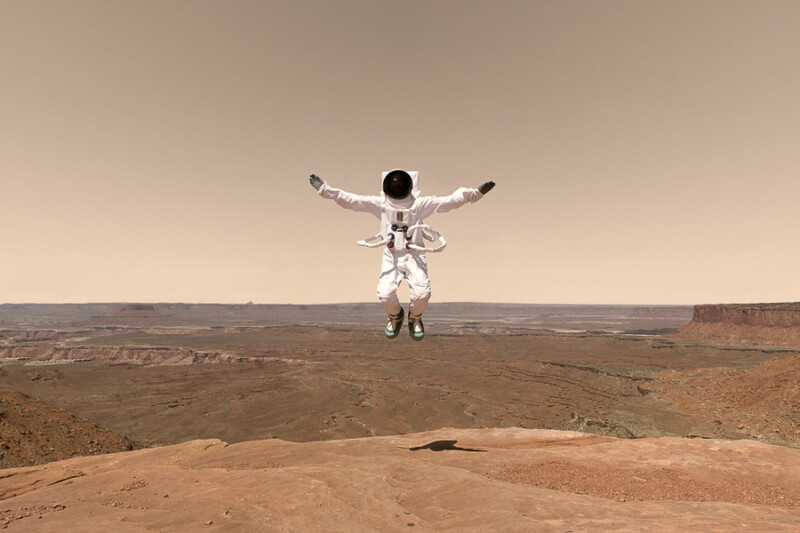 Mauve's series offers a wonderfully deadpan view of the red planet, with anonymous explorers eager to survey the grounds, and, possibly more importantly, document the process. "It's an observation of our current behaviors and a projection of what we hope for the future," he explained. "I'm not trying to stick to the scientific truth." 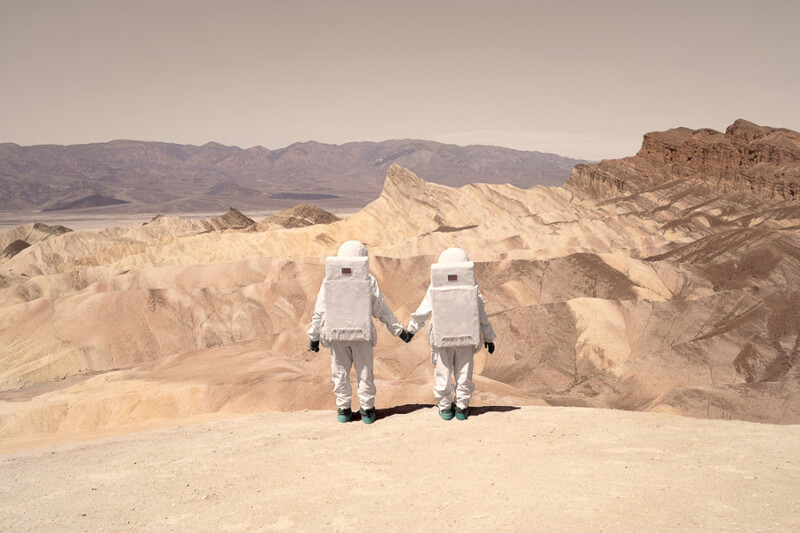 Of his series, he explains the setting: "It's a couple experiencing Mars as tourists for the first time and sharing their experience through photographs. They include themselves in front of those landscapes and affirm their presence but the funny thing is that we don't see their faces. 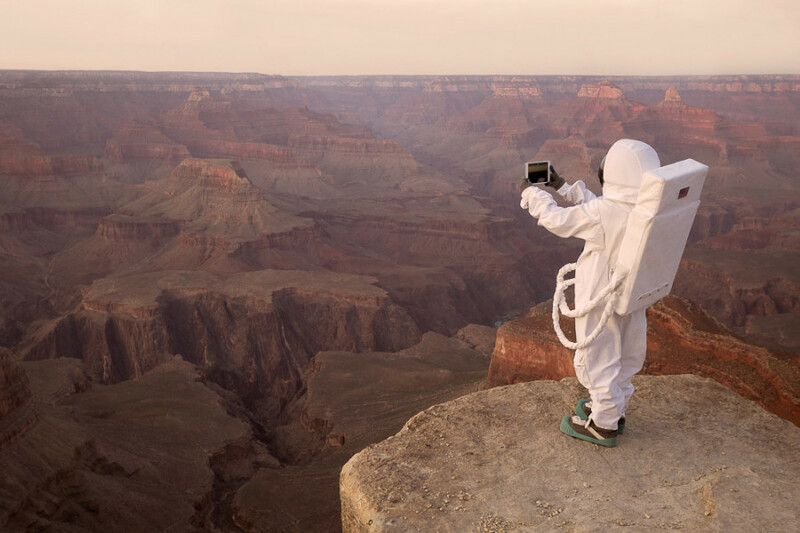 It could be anyone in those suits and, in fact, it goes against the original purpose of taking a selfie or souvenir pictures. It was also a way to illustrate this endless pursuit of self-definition we seek with pictures." Check back with us in 100 years to see if Mauve's grim prediction has come to life. If so, please let us know what filters look best in space. Thanks. This Hubble Space Telescope photo shows NGC 2174, the "Monkey Head Nebula," located 6,400 light-years from Earth. A powerful X-class solar flare, one of three X-class flares unleashed by the sun on June 10 and 11, as seen by NASA's Solar Dynamics Observatory. X-class flares are the most powerful kind. Hubble image of the barred spiral galaxy M83, the "Southern Pinwheel," which lies 15 million light-years away in the constellation Hydra. This mosaic image was released in January. Astronaut Koichi Wakata tweeted this view of a crescent moon rising and the cusp of Earth's atmosphere on Feb. 1, 2014. Galaxy NGC 4258, located about 23 million light-years away from Earth, as seen by NASA's Chandra X-ray Observatory. This photo of a "rainbow aurora" was taken by ISS astronaut Alexander Gerst. This close-up image of part of Saturn's rings was taken by the Cassini spacecraft on June 30. It shows, from left to right, the outer portion of Saturn's C ring and the inner portion of the B ring. ISS astronaut Reid Wiseman tweeted this image of a sunrise on Oct. 29. Wiseman wrote, "Not every day is easy. Yesterday was a tough one. #sunrise"
This image taken by NASA's Solar Dynamics Observatory shows a profile view of coronal loops. Coronal loops are found around sunspots and in active regions. This image shows the sunlit side of Saturn's rings. It was taken in red light by the Cassini spacecraft's narrow-angle camera on Aug. 23. Several celestial objects photographed in the same field of view by Spanish-American astrophotographer Rogelio Bernal Andreo, including supernova remnant Simeas 147, the "Flaming Star" nebula, nebula IC 410, and galactic clusters M36 and M38. Astrophotographer Rick Stevenson released this photo of SH2-199, also known as the "Soul Nebula," in December. This emission nebula is located about 6,500 light-years from Earth. This Hubble image shows a portion of the Large Magellanic Cloud, a small nearby galaxy that orbits our galaxy, the Milky Way. A new day dawns on Saturn. The image was taken with the Cassini spacecraft's wide-angle camera on Aug. 23. The photo is a composite image of the spiral galaxies NGC 2207 and IC 2163, located 130 million light years away in the constellation Canis Major. The image contains data from the Chandra X-ray Observatory in pink, optical light data from the Hubble Space Telescope in red, green, and blue, and infrared data from the Spitzer Space Telescope in red. In January and February 1979, NASA's Voyager 1 spacecraft zoomed toward Jupiter, capturing hundreds of images during its approach, including this close-up of swirling clouds around Jupiter's Great Red Spot. This image was assembled from three black and white negatives and newly released. An extreme ultra-violet wavelength image of a solar flare captured on Sept. 10. This Hubble Space Telescope composite image shows a supernova explosion designated SN 2014J in the galaxy M82, at a distance of approximately 11.5 million light-years from Earth. It was taken on Jan. 31, as the supernova approached its peak brightness. An image of the Tarantula Nebula (or NGC 2070), located about 160,000 lights years away, released in January. This composite image shows one of the clusters, NGC 2024, which is found in the center of the so-called Flame Nebula about 1,400 light years from Earth. In this image, X-rays from Chandra are seen as purple, while infrared data from NASA's Spitzer Space Telescope are colored red, green and blue. Saturn's moon Tethys captured by the Cassini spacecraft's narrow-angle camera on July 14. The Philae lander took this portrait of the Rosetta spacecraft on Sept. 7, 2014, at a distance of about 30 miles from comet 67P/Churyumov-Gerasimenko. The puzzling, fascinating surface of Jupiter's icy moon Europa looms large in this newly-reprocessed color view, made from images taken by NASA's Galileo spacecraft in the late 1990s. A widefield view of the Flame (NGC2024) and Horsehead (IC434) Nebulae in Orion, captured in December by astrophotographer Roger Hutchinson. The pair are approximately 900 to 1,500 light years away. Comet 67P/Churyumov-Gerasimenko, captured on Aug. 3, 2014 by Rosetta's OSIRIS narrow-angle camera. The Orion Nebula, an immense stellar nursery some 1,500 light-years away. This stunning false-color view was constructed using infrared data from the Spitzer Space Telescope. NASA astronaut Reid Wiseman captured this image from the International Space Station and tweeted it on Sept. 28, writing, "The Milky Way steals the show from Sahara sands that make the Earth glow orange." European Space Agency astronaut Alexander Gerst tweeted this photograph taken from the International Space Station to social media on Aug. 29, 2014, writing, "words can't describe how it feels flying through an #aurora. I wouldn't even know where to begin…." This view, captured by the NASA/ESA Hubble Space Telescope and released in July, shows a nearby spiral galaxy known as NGC 1433. At about 32 million light-years from Earth, it is a type of very active galaxy known as a Seyfert galaxy--with a bright, luminous center comparable in brightness to that of our entire galaxy, the Milky Way.